If you are reading this email on your smartphone, particularly on a weekend, you are part of the marketing miracle Steve Jobs brought us 10 years ago with the iPhone. While Jobs made smartphones ubiquitous, literally bringing the Internet into the palm of our hands, he might not have understood the devices will also be looked back at as the single most important innovation when it comes to selling the Super Rich, even if many marketers haven’t fully embraced it for such yet. Marketing to the Super Rich has always been about access and striving to get into the same orbit as the very wealthy. There are companies that will sell you data about which boards they sit on, where they went to school and the names of their children. In the world of one-to-one marketing, a friend introduces you to an UHNW prospect at the club they both belong to. Luxury companies spend tens of millions to partner with charities to have awareness at important philanthropic events where the Super Rich are involved in organizing committees. How do we get our brand inside of the velvet rope and mix with UHNW prospects? It’s a question all luxury brands think about. During events such as Art Basel, luxury brands invest large sums hoping to attract the very rich amongst the throngs that just want to pose for smartphone pictures and drink free champagne. Brand sponsorships can run into the millions. The arts – be it opera, museum galas or the ballet were always go to places to reach the Super Rich. But today we are more likely to find UHNWs anywhere and everywhere from running Iron Man triathlons to fishing tournaments in Los Cabos, kite surfing in Puerto Rico or spending their fall Saturday’s in luxury skyboxes in Norman, Oklahoma, Anne Arbor, Michigan and Columbus, Ohio. The passions and interests of the Super Rich have never been more diverse, meaning it’s harder than ever to find a significant number of Super Rich one place. In fact, many of the places we find the Super Rich these days aren’t venues luxury brands would see as a fitting as a showcase for their goods, right or wrong. A few, like Hublot, have braved into mass sports stadiums, but still, these efforts are the exception to the rule. Research continues to show the more affluent one is, the more likely they are to read magazines, and luxury brands have always rightfully used magazines as a way to reach the Super Rich. Still, many magazine publishers trying to fund their ideas on how to become the next Facebook have gutted their print publications turning great print franchises into shadows of what they once were. Direct mail was yet another favored marketing approach to reach the Super Rich. Send them something nice, like a hardcover book from Assouline to get it by their personal assistants, who unlike for you and me ferret out solicitations from the real mail before it is passed on. After all, the Super Rich have people who pay their American Express bill. They don’t go through the statement stuffers. We all know that the web is being driven by content marketing, however, in attracting the Super Rich, getting them to come to your website is hard. They are time pressed, and most of the time they are spending on their smartphone or laptop is going through emails, texting and other tasks related to work, friends or family, not simply cruising luxury websites. So how are some luxury sellers using smartphones to sell to the Super Rich? Smart travel agents have their UHNW clients follow their personal Instagram and Facebook pages. When they travel to luxury hotels and resorts, they post pictures and many times get instant messages back from loyal customers asking them to book suites and villas that can range to $10,000 or night or more. Jewelers who have deep personal relationships text images of a watch or bracelet they think a specific customer would like, particularly in advance of a birthday or other milestone. They also post images when they attend shows in Vegas or Basel. While a Super Rich individual isn’t likely to follow Brand X, they are very likely to follow their favorite salesperson with whom they have a personal relationship. Since I launched DG Amazing Experiences, my weekly luxury travel e-newsletter in 2015, I’ve averaged an Open Rate of over 20% and now have over 20,000 private jet owners and CEOs who receive it every Saturday – yes, that’s right, Saturday mornings. Over 80% of my readership is on smartphones (Thank you Steve Jobs!) and CEOs check their emails on smartphones 75 times a day, so I suppose on the weekends they have more time for leisure reading. On some holidays I’ve had open rates over 30%. The key, of course, is providing them with content they find of interest. One only needs to go to Teterboro or Van Nuys and look into the lobby of the FBOs to see the wealthy waiting for their private jets while the tap and talk on their smartphones. It’s the same deal in the luxury skyboxes at college and NFL football games, and even as they are standing in parties and social events. I envision someday there will be virtual luxury boutiques on the walls of FBOs where the Super Rich can point and click their smartphones, and have whatever they bought delivered wherever they are going by the time they land. In South Korea, commuters order dinners to be delivered to their homes in a similar way, so we are not that far away. While reaching the Super Rich is never easy, you can thank Steve Jobs for giving us new and cost-effective ways to have them buying what you are selling, literally right out of their own hands! Back in January, I wrote about what luxury marketers can learn from President Donald Trump. After all, while the President may not be a run-of-the-mill billionaire, it is still an unusual opportunity to have Super Rich individual and his inner circle under such a continuous spotlight. Among the points I made back then, pretty much all of them have been reaffirmed. For example, the Super Rich like to talk to decision makers directly. One only has to note the President’s direct dial diplomacy to see that he has little patience for highly orchestrated conversations meticulously planned by staff. Same goes for my point about loyalty. Examples of winning strategies go to Saudi Arabia and Israel. In both cases, they combined flattery with providing the customer an experience he enjoyed, think sword dancing and glowing globes. On the other hand, NATO made the President one of a group. Think of the video where President Trump was seemingly pushing past the Prime Minister of Montenegro to get to where he thought he should be, at the front. The point isn’t that all of the Super Rich are alpha males. The point is you are more likely to have a prospect in the buying mode when they feel comfortable and entertained. The James Comey hearing shows that even powerful advisors and subordinates don’t necessarily want to push things when they think it goes against the UHNW’s wishes. Whether it’s self-preservation or other reasons, chances are you are going to have to close your deal. As I mentioned back in January, CEOs like to talk to CEOs which means to get the deal, having your owner or CEO ready to make the direct call to the prospect can often be a key to closing the deal. It’s a place the conglomerates sometimes lose out to smaller owner-operated firms. When selling to the Super Rich it helps if your CEO is a closer. While everyone has their opinions of the American President and this isn’t political, trying to understand where you stand is often hard, and the information you get is often misleading. As the former FBI Director noted, while there are some truths being published, they are published alongside fiction. Don’t spend time fretting about rumors around the water cooler. Do whatever you can to keep a 1-to-1 dialogue with the UHNW even if it with texts, or sharing some information you think he/she would be interested in, even if it’s not related to what you’re selling. One of the pleasant realizations about having a circle around you and lots of money, is you have other people to deliver bad news and push along unpopular agendas. What it means is when you are 1-on-1 with an UHNW they may not be direct in telling you what they want, but deal with inferences. Unless they are asking you to do something unethical or illegal, you should assume they want it done. While luxury brands spend hundreds of millions of dollars on boutiques and luxury cathedrals in the most real estate around the world, many UHNW prefer house calls. We’ve seen how President Trump enjoys showing off both Mar-a-Lago and the White House to visitors. Never pass up an opportunity to visit an UHNW client or prospect, and when possible open the door. “I can come to your (office/home) if it’s more convenient.” In addition to providing the Super Rich with the benefit of saving their time, you create an opportunity to expose more of themselves to you, meet more of their staff, family members, relatives, and associates. You also get a first-hand look at their unique style and a bigger window into their passions and interests. Online clubs, social networks, concierge services and contrived events designed to attract the Super Rich pop up regularly, mainly designed to generate either membership fees or dollars from luxury sponsors, sometimes a combination of both. From A Small World (an invitation-only Facebook for the very wealthy and attractive) to last weekend’s Fyre Festival (a Coachella for folks who have a private jet – you had to fly to Great Exuma in The Bahamas) which went kaput amidst cancelled musical acts and bread and cheese sandwiches instead of caviar and champagne, most of these ventures fail to achieve tangible results for the luxury brands they seek sponsorships from. The come on is a similar formula again and again: Get some celebrity “investors” and influencers who spread the word via their extensive social media accounts. Get a bit of TMZ or Page Six-type buzz. Create visuals showing the target client as one of several stereotypes, either logo-clad 20-or-30-somethings on a private jet with a puppy, in a trendy hotel bar or scantily clad partying on a Mediterranean beach. While many of these attempts to create a network of affluent consumers the organizers can then leverage by marketing them to luxury brands don’t end up in tatters as did Frye, my experience is, for the most part, they don’t deliver the high-spending customers luxury brands are seeking. The general result is luxury marketers end up paying money to serve a good looking crowd with very little buying power some champagne. Now I understand why the UHNW are a popular target. There are just over 200,000 Super Rich families and they spend over $230 billion a year on luxury fashion, jewelry, watches, accessories and travel. In fact, this small sliver of the world population accounts for over 20% of all luxury spending. Unlike the mass affluent, they are less likely to cut back during downturns and they don’t have to worry about getting laid off since they own the company. They also don’t fit into the stereotype most of these clubs and festivals target. Like many of the influencers who promote these products, over 80% of the Super Rich are self-made, many entrepreneurs that started their own companies. The difference is unlike celebrities, their pathway to wealth is more likely to be construction, farming, manufacturing, distribution, services or retailing than being able to sing or having their own TV show. They are generally shrewd and while they spend a lot on luxury, they do not need to be part of clubs trying to attract posers and they don’t need a specific brand of loafers to give them affirmations. In other words, the entire marketing most of these clubs and festivals use are the antithesis of the psychography of the Super Rich. Still, luxury companies want to get face time with UHNW, so what ways work? The answer, for the most part, is to go where the Super Rich go, but that’s not always enough. It’s why we see a traffic jam of luxury brands at venues such as Art Basel. However, the challenge is finding the very wealthy while not being overrun by those just trying to get a peek over the wall. Many events that attract the Super Rich attract lots of gawkers as well. However, there are effective ways to work around these challenges. Some examples are to look at places you can target the wealthy directly. One area that I think is intriguing is luxury boxes at pro and college sports events, particularly sports such as football where the best viewing is from luxury boxes. The cost of a luxury box for a pro football team runs into the hundreds of thousands of dollars, and not all eyes are glued to the game. College football games can get several hundred private jets with wealthy alumni flying in. Megayacht shows are another good venue if you’re in the right place. The Super Rich don’t come to shows like Ft. Lauderdale, Monaco or Palm Beach to admire the super yachts, they come to charter them, buy them or build them. 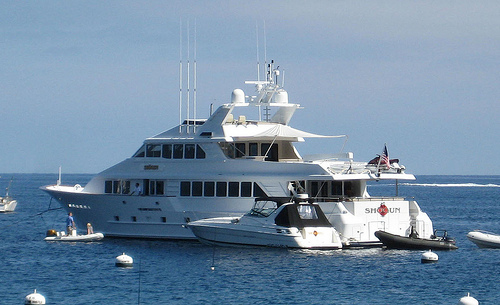 Unlike the masses who buy day tickets and walk around, the Super Rich come to the shows with set business appointments to view yachts they are interested in buying or chartering. By partnering with a yacht broker, luxury companies can be part of their VIP lounges where UHNW customers come to meet their broker and where they relax between viewing yachts. While cultural events like opera certainly come to mind, you will also find the Super Rich participating in big game fishing tournaments or attending trade shows at industries where they own or manage businesses. If you want to pick off a dozen or more top CEOs pick key industry B2B conferences where they attend as keynote speakers, to announce new products and hold press conferences. Because the interests and sources of wealth of the Super Rich are fragmented, so are the places you will find them. While it takes a bit of work to find the right venues and organize smart interactions, at least the people you will be talking to will be your true UHNW target instead of some nice looking people who will be back in their cube Monday morning. Private jet cards are similar to debit cards in that you prepay a set amount of money into an account and then money is withdrawn from that account each time you use it. The two big differences are the amount of money, for jet cards, it’s usually between $100,000 and $500,000 and that you don’t really swipe, you or your assistant calls your customer service rep or in some cases, you can make your request via an online app. By any stretch of the imagination, even for a billionaire, $500,000 is not chump change, and many purchasers already own planes but need a supplemental lift. Think of the Ultra High Net Worth (UHNW) family like your family. You often need more than one car at one time, so Super Rich families need access to multiple planes sometimes, but not often enough that it makes sense to own a second plane. This goes for companies with one or two planes also. Or sometimes, you might need a larger and longer range plane. Either way, jet card and prepaid block charter program customers typically fly privately between 25 and 500 hours a year. According to Business Jet Traveler, in selecting the right program, 76% choose the program based on the recommendation of a friend or experience with the provider often is hitching a ride with a friend followed by 9% who simply searched on the Internet. Only 5% used a broker and only 3% used a consultant, the latter being a very small number for such a big purchase with lots of variables. In trying to write a story for Forbes.com about buying private jet cards and prepaid private jet programs, I put found over 75 different programs with 62 points of difference from hourly rates, standards for sourcing crew and airplanes, policies on flying unaccompanied minors, minimum daily charges and so forth. To assist buyers I’ve put them into a series of easy-to-use spreadsheets and broken them into logical chapters. You can find it at PrivateJetCardComparisons.com. According to Wealth-X, the Super Rich spend over $230 billion a year on luxury from fashion to jewelry, watches, cars, autos, spirits, planes and boats, so clearly they are a critical segment. However, it’s rare that an Ultra High Net Worth (UHNW) individual is under a bright spotlight for an extended period of time. As President of the United States, Donald J. Trump provides a unique window for luxury marketers who are targeting UHNW consumers. Trump’s wealth profile is not dissimilar to many of the Super Rich. While there was family wealth, his current fortune is mainly based on his entrepreneurship. In fact, his parents lived a fairly modest upper-middle-class life in the non-ritzy borough of Queens, a few miles from Manhattan but a world apart. Like most UHNWs, he has had big successes (his residential real estate buildings, hotels, golf courses, beauty contests, books and TV shows) and other businesses that didn’t go so well (Trump University, Trump Vodka, etc.). Few, if any entrepreneurs don’t have as many failures as successes. Still, many luxury marketers gravitate to stereotypes about the Super Rich, such as they are all about cultural events, fine dining and they all come from Ivy League schools. President Trump shows that UHNWs are truly not homogenous. Fine dining isn’t necessarily the way to the wallets of the Super Rich. Yes, some do like the celebrity chef culture and look at Michelin ratings. However, the fine dining audience is an accessible luxury, where for a couple hundred dollars the Mass Affluent can indulge. Look at President Trump’s food preferences, well-done hamburgers, including local Manhattan chain Jackson Hole as well as fast food such as McDonald’s. Even at Jean-Georges, the Michelin restaurant in his hotel on Central Park, reports say he orders a simple steak. Loyalty is important. In interviewing sales superstars for my book, “Secrets of Selling to the Super Rich,” each of the top sellers underscored that the integrity of their relationships trumped the product they were selling. The most successful way to sell to UHNWs is to be loyal to their interests. Pushing products to meet a company quota is a sure fire way to find your access cut. It’s not about your brand’s DNA. Understanding the passion points of individual UHNWs is a smart way to build a relationship. Speak about what’s of interest to them. If you want to strike up a conversation with President Trump, talk golf. UHNWs aren’t focused on your latest product launch. When I surveyed the over 21,000 readers of my weekly invitation-only private jet owner e-newsletter, only 15% said they read luxury magazines or e-newsletters. Most of their readership was focused on B2B media for the industries where they own, invest or manage companies. One only needs to look at President Trump to see that same focus. UHNWs want to talk to decision-makers. President Trump in his first few days has held meetings with top CEOs and has arranged a visit from the Prime Minister of the UK Theresa May. For normal politicians, arranging these meetings would have taken months of negotiations between subordinates. In other words, if you want to build credibility with Super Rich prospects, your senior management needs to support you and quick response will help you get the sale. Having your CEO ready to help can cut through endless meetings with subordinates that may go nowhere. The Super Rich don’t like to hear no. Most of them got where they are by pursuing ideas others told them were doomed to failure. Sometimes the naysayers were right, but it only takes business idea to create a fortune. Work with UHNWs to help them achieve what they want, so if you can’t fulfill their request, they can see that you were their teammate in trying your best to make it happen. The Super Rich know that if they don’t try, you will never know if it would have worked. They are often risk takers. Show them you are in it for them and are giving 150% to make it happen. Sometimes stereotypes can be correct. Trump and his children are University of Pennsylvania graduates even though there are more UHNWs who dropped out college than those who matriculated from an Ivy League institution. The family is important. While there is no question who’s the boss, as is clear from the Trump family, sons, daughters and family members are often part of key decisions are need to be considered as you build your UHNW relationship. Acquisition of new ultra-high-net-worth (UHNW) consumers will be key to building sales for luxury brands as they adapt to the new normal of annual growth in the 3-5 percent range, down from 8-10 percent during the halcyon days of the past. The fastest-growing demographic for buying luxury is at the top of the pyramid, according to a presentation by The Boston Consulting Group held for Luxury Marketing Council members held in New York. Households with a net worth of $20 million or more are expected to increase purchases of luxury goods and services by a whopping 80 percent by 2022. At the same time, aspirational consumers, defined as having a net worth of less than $5 million, will only grow buying by 4 percent per annum in that same period. “The top of the pyramid will be the driver of luxury growth over the next five years as aspirational consumers take a back seat and marketers come to understand there’s no new China,” BCG managing director Robbin Mitchell told the audience of marketers. To increase sales, brands will have to look for new super-rich clients. Ms. Mitchell said during the past five years brands over-invested in existing customers at the expense of spending to acquire new UHNW customers. “After 2008, a lot of luxury retailers focused on the top of their files [of big spending customers],” Ms. Mitchell said. That tack by luxury marketers had some reasoning behind it. “They tried to expand share under the logic that they had behavioral history, and there was a higher ROI,” said Christine Barton, senior partner at BCG. While consumers want instant gratification such as same-day delivery, they are willing to wait for personalized products. The personal and experiential luxury market is currently valued at $930 billion. Personal luxury, which includes accessories, apparel, watches and jewelry, perfume and cosmetics accounts for $355 billion in purchases. Experiential luxury, which covers furniture, food and wide and vacations is $574 billion. Cars and yachts account for an additional $445 billion in spending, while technology, arts and other luxury purchases add $321 million in spending. In terms of personal luxury, watches and jewelry account for $141 billion in annual global spending, according to BCG. Accessories are $85 billion and apparel $77 billion, followed by perfume and cosmetics at $51 billion. Luxury hotels and vacations account for $439 billion in experiential spending, with food and wine at $76 billion and furniture at $59 billion. While demand in emerging markets accounted for 35 percent of growth in the past decade, BCG estimates it will only be 10 percent in the next 10 years. Overall, the share of sales to the top of the pyramid will increase from 29 percent today to 32 percent and $402 billion across personal and experiential luxury. AMONG THE OTHER important takeaways, six in 10 luxury purchases are now digitally influenced, and word of mouth has supplanted traditional magazines in influencing luxury purchases, mainly through blogs, social media and digital. The BCG consultants said luxury marketers have to do a better job of understanding the customer journey. For example, UHNW consumers are now more global. But many luxury brands are still structured with most marketing done at a country level. “They need to adapt,” Ms. Mitchell said. As marketing focus goes online, it raises a key question. First of all, to clarify, the generally accepted definition of Super Rich is to have assets or net worth of at least $30 million. While some researchers put it at $50 million, and others say $25 million. These vagaries mean that there are different estimates for the population of UHNWs (Ultra High Net Worth families), but they range from slightly over 100,000 to just over 200,000 based on the criteria. Wealth-X reports that the Super Rich spend over $230 billion per year purchasing luxury jewelry, watches, fashion, travel, autos, redecorating their houses, dining out and so forth. In categories such as jewelry, watches and travel this sliver accounts for 20 percent of more of percent all purchases. When you think about the UHNW population and to put its small size into perspective, keep in mind that 1.3 million people are killed in car accidents each year. Wyoming has 582,000 residents, and even Iceland has a population of 329,000. In other words, while there may not be lots of Super Rich, they are a critical part of the revenue mix for sellers of luxury goods and services. Last December I launched a weekly travel and lifestyle e-newsletter for private jet owners and C-level executives of companies that operate private jets. In just over six months the readership has grown from 12,000 to over 20,000. As I was building up the database, I spent a lot of time focusing on what type of content my Super Rich readers wanted, and how they wanted it delivered. There are lots of ways to become Super Rich. While I always knew that the UHNW community was extremely diverse, looking at who owns private jets and what type of businesses they own and operate reaffirmed that many of the stereotypes are far too narrow. In addition to bankers, tech executives, lawyers, Fortune 500 bosses and the like, I found a surprising amount of farmers, distributors of products from medical devices to fruits and laundry detergent, manufacturers (a number of which after studying their websites I still couldn’t figure out what the things they made did), retailing (from convenience stores to auto dealerships), builders, including one who builds tug boats. It was also revealing how many have made fortunes supplying big companies whose names we know with parts and components that go into the products they make. While there may be a concentration of the Super Rich in global capitals, they are all over the place. I have readers in all 50 states and over 50 countries, and my newsletter is only in English. They are open to accessible luxury. My report on The Haven, a luxury ‘hotel within a hotel’ aboard NCL’s Breakaway titled, “Can you have a luxury experience on one of the world’s largest cruise ships?” was very popular. Hotels under 50 rooms and luxury resorts were at the top of the list on what they want content about, specifically reviews about the different types of suites and villas. At the same time luxury trains, private canal barges and active experiences rate highly. At the same time, when I have done reports on city hotels such as Baur au Lac in Zurich and Peninsula in Shanghai, they have gotten excellent response. Email can be very effective if you have content they want. My open rates range from 17 to 42 percent, with even the lowest being about double the normal open rates for this segment, according to people I’ve compared notes with. The smartphone is they best way to reach the Super Rich. Over 80 percent of my readers open my emails on their smartphone. Holidays are the best time to email the Super Rich. My highest open rates have come on Christmas Day, New Year’s Day, Easter Saturday and so forth. Saturday morning is magic if you want to email the Super Rich. While conventional wisdom in digital marketing is to focus Tuesday to Thursday from 10am to 4pm or Thursday and Friday afternoons as people are starting to think about the weekends, my experience with my UHNW readers is the weekends are significantly better with a cascade of opens as soon as my email gets into their inbox, and then later Saturday night picking up again, peaking again Sunday morning, Sunday night and a final burst Monday morning. They hate slide shows. So do I, but this was one thing I was told ‘don’t do it,’ when I was testing formats. I don’t do it, but I am amazed at how many websites do this, obviously to drive extra impressions, which is driven by advertisers who push publishers for quantity over quality when it comes to online experience. In fact, my website is really just an library of past newsletters they can come back to reference. The Super Rich want the entire story in the email. While most emails are link bait to go to a website, at least for my content, my readers told me, ‘Give me everything I need to know in one place.’ They told me specifically they didn’t want me to link to important content, but include it in the newsletter, which means my emails run 2,500 to 3,500 words. I’ve been told by having one comprehensive email, it makes it easier to read on their smartphones, both when they are offline or when they are with other people and don’t want to be seen clicking around. They don’t read mainstream travel and luxury media. 85 percent told me they don’t read any travel or luxury lifestyle magazines or newsletters. What do they read? Most listed three to five trade magazines or websites, related to their business, then there was a smattering of enthusiast titles related to sailing, diving, fishing, hunting, fitness, watch collecting, yachting, model trains and so forth. No single publication was cited by more 5 percent of my readers. To me, this underscores that brands large and small truly need a separate UHNW marketing strategy — one size does not fit all! While the above may or may not apply directly to your marketing efforts, I think that some of my experience underscores that when marketing to high-value UHNW customers, simply using the same formats and tactics you do with regular folks might fall short. Her mom Jane Gordon was a gossip columnist for the Sunday Mirror. ** Gossip columnist, of course, is one of the stranger realities of journalism. It’s a symbiotic relationship where for the most part, the people one is revealing tawdry tales about need exposure to assist in their celebrity. You might be surprised, it often takes very keen reporting skills, as one is usually walking the fine line of legal actions. Sometimes people get hurt. I have no idea if Bryony Gordon‘s mother was good, bad, professional or anything about what type of integrity she brought to her job, but good gossip columnists are actually highly skilled reporters, contrary to what most of the public perceives. I can tell you, the younger Gordon seems to lack the same skill set as her mother’s segment of the profession. I have a Google alert for news related to “Super Rich.” It provides an interesting mix of tidbits. Today, the top item read “Bryony Gordon: The only attractive quality of the super-rich is their money.” She is a columnist for The Telegraph, and it appears that her gig means churning out something at least once a week if not more, not always an easy task. I give her credit for using her column to talk about her own depression and bring mental health issues to the forefront. It’s very brave, and she deserves congratulations. Jealousy, however, is a dangerous thing, and today’s column was all about ignoring the facts and perpetuating incorrect stereotypes. Maybe she didn’t have time to do the research. Her targets may or may not have been worthy, including a Kazak oil baron, Sting who rails about the environment, but then took money from the billionaire to play at his son’s wedding, a hedge funder who apparently likes cocaine and orgies as well as a 46-year old UHNW entrepreneur who is divorcing his wife of 14 years and dating a 27-year old “Polish lingerie model”. I’m not sure the relevancy of where his girlfriend is from. Would it have been different in Ms. Gordon’s view if the lady was from Bournemouth? Dear Bryony, let me give you a few facts. Mostly, the term Super Rich refers to folks with a net worth of $30 million or more. Wealth-X, which does a pretty good job researching the market, estimates there are about 210,000 households globally that qualify. There is quite a bit of research about where their money comes from. Yes, some had connections to get a foothold into their profession as you did from your mother. I had entry from my father, for which I am grateful. But as they say, once you get in the door, it’s your show, and clearly you’ve done very well. But just to enlighten you, most surveys show about three-quarters or more of the Super Rich are self-made. From a book I co-authored in 2007 where we interviewed over 600 private jet owners, close to 90 percent were self-made. Then again, the reason most had their private jets was a business tool, not to showoff to Architectural Digest. Yes, there are celebrities and oil barons, but I think you might be surprised that your narrow view of rock stars and Knightsbridge doesn’t represent the global population. In fact, in terms of where they come from, you might be surprised that there are more Super Rich families from the American flyover state of Minnesota than Saudi Arabia, and the same for Wisconsin vs. Russia. How did they make their money? Think mundane things like manufacturing all sorts of parts and devices, distribution of everything from oranges to medical devices, farming, auto dealerships, operating franchises of all types, making packaging, real estate development, and not just office towers, but communities for all types of folks. There are lawyers, fund managers and global bankers for sure. There are also local bankers, whose community banks operate throughout the South, West and Midwest in the US and are still a place small businesses can get a loan to start or expand. And by the way, what did Sting do with the money he received from playing the wedding? I don’t know, but Wealth-X notes UHNWs donated $112 billion in 2014. As an aside, American billionaires, according to the research, donate an average of $179 million in their lifetimes. Of course, what your rant ignored is that for the vast majority of the Super Rich, they didn’t lollygag around daydreaming. They spent a good part of their adult lives making if happen. I say kudos to them. Lot’s of very inspirational stories about folks who came from nothing and made a lot, in some cases creating things that improved our lives. And, yes I do understand that it’s a challenge to turn out quality columns and still drive the Internet clicks your bosses judge you on. Of course, finding the UHNWs I described and you are not aware of can be difficult. Like most of us, they are living below the radar, more than happy to spend time building their business and enjoying life with their friends and family privately, not showing off. In December I launched an e-newsletter for private jet owners focused on travel. To do so, I needed to build a database of owners, no easy task. But first let me clarify. When I say jet owners, it also includes C-Level executives at larger companies that operate multiple jets. I also included owners of the popular Beechcraft King Air, though a turboprop, it carries up to eight passengers and a new 350 version runs $7.5 million. I additionally included helicopters. The worldwide fleet of private jets, King Air turborprops and helicopters is just over 25,000, so with my database now up to 16,000 names I cover a nice piece of the market. In building the database, which entailed licensing three different databases, then spending over 1,000 hours of research covering hundreds of websites, I learned a lot about private jet owners. Full disclosure: I wasn’t starting from square one. In 2007 I co-authored the book “The Sky’s The Limit: Marketing to the New Jet Set” based on over 600 interviews with owners and fractional owners of private jets. I also started a magazine in 2001 called Elite Traveler, which was distributed via private jet terminals, corporate flight departments, fleet operators and caterers. That said, this project included an enormous amount of granular research. In the case of privately held companies, it often meant reading newspaper articles from business journals about my subjects. In public companies that operate private jets, it meant reviewing Annual Reports and SEC Filings to assess how much compensation senior executives made. My research confirmed findings that have been published by Wealth-X in that there is a lot of wealth beyond the traditional go to places of California, New York, Florida and Texas. It was interesting to find very wealthy individuals spread across all 50 states, including places like Iowa, Nebraska, Kentucky, Alabama and other places that might not readily come to mind. My readership in fact includes all 50 U.S. states and over 40 countries. While I certainly found lots of wealthy folks in banking, finance and insurance, the list of industries that spawned private jet owners was extensive, including farming, from pigs and cattle to apples and other fruit. And of course there was produce distribution, and then companies that make farm equipment. In oil and gas, I found not only people who made a lot of money drilling and refining but also laying pipeline and manufacturing components of pipeline and other industries that support oil and gas. There are readers in media, sports ownership and entertainment as well as auto dealerships, auto racing, legal, pharmaceuticals, logistics, consulting, beauty, fashion, real estate, hospitality, mining, education, franchising, frozen foods, pasta, jelly beans, education, research, utilities and any and all sort of manufacturing you can think of. If you are marketing luxury products and looking for Ultra High Net Worth consumers who can be regular customers, it is a good reminder that the typical stereotypes of the super rich are often misleading. If it’s time for the World Economic Forum in Davos, it’s time for another damning report by Oxfam about the One Percent, but before you say you’re too busy to care – and yes there are valid points such as tax avoidance – you may well be part of the greedy rich. Oxfam notes that entry into the One Percent, based on data it evaluated from Credit Suisse, means having total assets of just $760,000. So if your apartment, house, car, bank accounts, jewelry, comic book collection and whatever valuables you have add up to that amount, congratulations, you are in the One Percent. You may say, you don’t feel like you’re in the One Percent, and my response is, that’s my point. After all, you can’t even buy a studio apartment in Manhattan for three quarters of a million bucks. And by the way, to be in the top 10 percent worldwide takes a net worth of just $68,800. Please note, that’s not a household income, that’s net worth! However, if you are selling luxury goods here are a couple things to think about. Credit Suisse says, the assets of the top One Percent are now greater than the remaining 99 percent, so clearly that means that the One Percent is in fact a good starting point in terms of targeting consumers who can afford what you are selling on an ongoing basis. If you are marketing in the U.S., the entry point for Household Income to the One Percent is just under $500,000. But while making a half million dollars may provide a comfortable lifestyle with nice vacations and some luxury purchases now and then, it is not Super Rich, which is generally put at a Net Worth of at least $30 million and a household income in the multiple millions of dollars. Coincidentally, coinciding with the Oxfam report, SIHH, a major watch show opened today in Geneva. Sellers of Swiss high-end watches may see a decline in sales after two middling years, according to a piece in The New York Times by Victoria Gomelsky. She outlines how a perfect storm of declining oil prices are hitting the economies luxury consumers in Russia, the Middle East and Africa, while the crackdown on gift giving in China and the Apple watch are all conspiring to provide headwinds. With no silver bullet in sight, as China, Russia, Brazil and Nigeria provided in the booming 2009-2012 period when the U.S. economy tanked, what should marketers be thinking about in terms of boosting sagging sales? As part of a recent project I’ve been working on, I was able to ask about media consumption with UHNWs who own private jets. The most interesting point I found is what they read mainly revolved around two distinct areas: B2B Media for the industries where they make their money. I had previously never heard of Apparel, Auto Dealer News, Auto Dealer Today, Breeder, Citrus News, Citrus Industry, National Fitness, Turbine and Club Solutions. The second was areas of passion, with titles such as Car & Driver, Hunting, Hunting & Fishing, Sailing, Whitetail and Practical Horseman. Yes, there were watch magazines in the mix. My research was for a travel project, and the other thing that surprised me was the general lack of knowledge about some major luxury hotel news which was the talk of the industry, but was not even on the radar of the Super Rich. The again, 85 percent said they don’t read any travel magazines or e-newsletters. I suppose they are busy running their businesses. So my other takeaway, is UHNW consumers are probably not as familiar with what you are selling as you may think, despite all the A List places you’ve gotten coverage. There is a fairly large opportunity to strategically reach the Super Rich via media, however, the answers may not be obvious and unfortunately, most of the research used by media buyers to figure out where to allocate ad dollars doesn’t cover where the real action is, which is the top half of the One Percent. And by the way, if you were wondering how much it costs to replace a cracked windshield on a Gulfstream private jet, that would run you about $800,000, including labor. The question of what’s rich came up again this week when Gallup this week published the results of a new survey. From my perspective, it once again underscores the precarious position for luxury marketers who don’t have comprehensive marketing strategies to target the Ultra High Net Worth (UHNW) consumer (Think Household Income of $1 million +). My experience is many of the biggest and brightest believe marketing to the Super Rich is about having some private dinners, sponsoring a few cultural events, perhaps a polo tournament, and that’s it. Few, if any, have a separate media strategy to target consumers who make over one million dollars a year. Instead, it is assumed that general media plans are effective in reaching this target. Thirty-seven (37) percent of Americans making over $240,000 a year said they are “cutting back on how much money” they spend on a weekly basis. For those making $180,000 to $239,999, 42 percent are cutting back. In the $120,000 to $179,999 household income range, the percentage cutting back rises to 44 percent. From $90,000 to $119,999 it rises further to 52 percent, and continues to rise as you go lower. Gallup believes that consumers are skittish about the future, and would rather bank money than spend it. Of course, a Washington Post story revealed that in major metropolitan markets, a $250,000 household incomes leaves little wiggle room to begin with. With no new silver bullet markets such as Russia, China or Brazil to take the place of mass affluent American spenders, the Gallup numbers are a good sign that luxury marketers should be crafting a stand alone strategy to gain share of the over $210 billion the global Super Rich spend annually on luxury goods and services. While common wisdom among many luxury brands is that Arts and Culture is the best way to reach Super Rich patrons who are potential customers, a small sample survey by Wealth-X shows museums, operas and so on ranked fifth out of five philanthropic destinations for UHNW money. The “Generosity Index” looked at 20 of the most generous Super Rich givers and found Education to be the most popular cause with 18 of 20, or 90 percent of UHNWs donating in this category. Next was Health and Medicine, favored by 80 percent of Super Rich. Fifty-five (55) percent made major donations to Social and Humanitarian causes, followed by 40 percent for Community Development. Only four of the 20 UHNWs Wealth-X looked at, 25 percent, aligned themselves with Arts & Culture. Rae Paoletta is a “dreamer, news junkie, knowledge sponge” who is some type of writer or journalist for MTV. She also Tweets as @MTVIssues where “We tell stories that are changing the world and we just have a lot of feelings.” Her boss, Sumner Redstone, the controlling shareholder in MTV’s parent Viacom, is Super Rich. His net worth is estimated at $5.3 billion. In fact, Viacom CEO Philippe Dauman, thought to be worth $200 million, is also super rich. A quick search of Google looking for what the definition of “Super Rich” is would yield a multitude of answers from having an annual household income of exceeding $9.5 million or a net worth or $30 million, or even $50 million or more. Just reading the headline, it didn’t sound right. After all of the various estimates of Super Rich global population, the most generous, by Wealth-X, reports a mere 211,000 households worldwide with a net worth of $30 million or more. That equates to under one million people who are part of Super Rich households. It only took getting to the second paragraph to see where journalistically Paoletta or or whomever wrote the headline made their mistake. “Disturbing new research from Oxfam, an anti-poverty organization, asserts the world’s wealthiest 10 percent are responsible for 50 percent of all carbon emissions,” she wrote. Quick math shows 10 percent of the world’s 7.2 billion population equates to some 720 million people, of which the Super Rich make up approximately one million. The article also mentions the footprint of the richest one percent “could be 175 times that of the poorest 10 percent.” For continued clarity, one percent of 7.2 billion is 72 million. Again, the Super Rich total around one million. In fact, there only 16 million people worldwide who are single digit millionaires (out of the 720 million people who account for 50 percent of carbon emissions). A bit deeper look at the Oxfam statistics would have revealed the wealthiest 20 percent of the world’s population, about 1.44 billion people, accounts for nearly 70 percent of all emissions. My guess is that includes a good chunk of the MTV.com audience. Perhaps a more relevant focus for Paoletta is what she and her peers can do. Of course the Super Rich or Ultra High Net Worth (UHNW), whichever label you want to use, should be conservation minded as well. But let’s start with facts. The under one million Super Rich do not produce half of the world’s carbon emissions. Headlines like the one in Paoletta’s story only create a wider divide and make critical issues harder solve. And I do really miss the days when MTV actually played music. While perceptions of the super rich are often tied to what we read in the press, rarely do we get insights from the people who work directly for and with UHNW families. The Super Rich are generally diligent in making employees and service providers sign non-disclosure documents, and many that serve them have little to gain by spilling the beans as it would deter other UHNWs from hiring them. According to a report in the Australian media, angel investor Kai Peter Chang was happy to dish on the UHNW customers he worked for during his days in wealth management. Financial services is the “Concierge of Money” for the Plutocrat class; we were suit-and-tie wearing mandarins of their largesse, who knew the details of our clients’ finances better than they did; it was our job to anticipate their needs before it even occurs to them. Managing a massive personal fortune often means managing their dirty secrets. Money is a personality amplifier. If you are a poor person who hates gay people/broken-English-speaking immigrants/Republicans/whatever, your need for a paying job forces a level of decorum in your conduct, and you learn to keep quiet your most objectionable opinions so you can get along with your employers/customers. On the other hand, if you are a poor person who has a benevolent heart and genuinely wishes to help the less fortunate, your financial constraints will limit whatever level of help you offer to very modest levels; your efforts may be invisible to most unless they are direct beneficiaries of your generosity, or know you personally. Money removes these constraints: A wealthy bigot can afford to be a raging terror to whoever he or she wishes, with almost no consequences. I’ve witnessed multi-millionaires confidently drop shockingly racist/nasty remarks about gays/disabled/[insert group] in casual conversations. Most employees and service providers roll with the tide: We were trained to go along with it — they are the client, and their accounts are worth millions in fees over the course of their lifetime, so while we won’t join in the racist/bigoted banter, we won’t object either; we are trained to nod politely and refocus the conversation to the technical matters. A wealthy married man can incorporate separate businesses/LLCs for the sole purpose of buying property/spending money on the sly for his illicit lover(s). Control of financial trusts can used as chess pieces to manipulate family members/dependants/beneficiaries to bend to the will of the owners of the capital. Errant adult children of the wealthy who find themselves incapable of earning a living on their own, often find themselves in protracted legal battles with stepmothers their own age (their plutocrat fathers, having paid a fortune to rid themselves of their first wives, marry younger women who now vie for a piece of the dying man’s fortunes). If you put over US$100,000 on the table in any casino in Las Vegas/Macau/Monaco (which you can either lose or win), an entire battalion of high-touch specialists employed by the casino materialize to cater to your every whim, so long as you gamble at their tables. They know your name, your favorite foods, your favorite entertainers (“free tickets for you and your friends sir, and we can arrange for you to meet singer/rapper/comedian/magician so-and-so backstage!”) and your favorite recreational drugs (if you’re into such things — they will be discreetly tucked away in the bathroom of the penthouse suite of the hotel/casino where you are staying). While many wealthy philanthropists want to get credit for their contributions to charities/foundations they support (seeing their name emblazoned on their former university’s Major Donor walls, creating foundations in their names, etc. ), I was surprised by the number of people who wanted to remain strictly anonymous — the only entities who were aware of their donations of these people was the IRS (for tax deduction reasons), the recipient non-profit/foundation, and us, who facilitate/structure these large donations. There are many who view their wealth as a blessing that they entrusted to be good stewards during their lifetime; they take their responsibility seriously to leave the capital to the next generation along with imparting their most cherished values. Children of this second group are polite, respectful and thoughtful — they understand they occupy a rare and privileged position in society and are very careful about not lording it over others, and make sincere efforts to be worthy heirs. The former type of client was far more interesting (and lucrative for the firm, given the complexities of the layers of financial instruments deployed), the latter was far more pleasant to interact with. The most valuable thing I’ve learned is this: whether you are a rich dysfunctional bigot dropping N-words in my office and throwing your financial weight around while bankrolling mistresses through your shell companies, or a thoughtful philanthropist trying to quietly change the world for the better with your largesse, being wealthy is a relatively lonely existence. The problems you encounter, while very real and very frustrating, will not elicit sympathy from 99.999 per cent of the planet. Like being an exceptionally beautiful woman, most of the people who approach you are only after one thing, and that perspective warps your ability to connect genuinely with others — one of the most quintessential human needs. Almost everyone wouldn’t mind being a bit more beautiful or a bit more rich, but few can truly appreciate just how alienating it is to have either in such abundant quantity, that they become the object of desire/envy by everyone you meet. Doug Gollan is ranked by Verb as “Top 25 Digital Luxury Experts To Follow.” His 2014 book “23 Ways To Create More Sales Opportunities in 25 Minutes” ranked Top 10 in 3 Amazon business categories. As we approach Art Basel Miami in less than two months, I can make three predictions. Lots of luxury brands will spend tens of millions of dollars – yes tens of millions – throwing lavish parties. Secondly, lots of expensive art will be purchased in a very short time. Lastly, most of the marketing dollars will be at best an exercise in public relations. There is no doubt that the super rich have an affinity for expensive art and high-end culture. Look at the boards of any museum or philharmonic. And there is no doubt there is a strong connection because the artisan craftsmanship of beautiful jewelry, watches and the inspiration of fashion designers and other luxury purveyors with the talents of world class painters, sculptors, sopranos or tenors. Yet at the end of the day, much of the audience for museum galas or Art Basel Miami parties is not the Ultra High Net Worth or Super Rich consumer that the luxury brands are hoping to network with and cultivate as customers. In fact the Miami Convention and Visitors Board expects close to 100,000 people to flock to the city. In the convention center alone over 250 galleries from 31 countries will be represented. If 2015 is anything like past years, there will be around 300 to 400 private jet flights bringing in the wealthy. If you want to say there is an average of six people on the jet, we are talking about 2,500 people who are probably UHNW, usually defined as having a net worth of at least $30 million. And while that is a nice concentration of the well to do, it isn’t much different than what you would find tomorrow in any number of cities across to country from South Bend to Baton Rouge and Austin, Texas. Major collegiate football teams draw between 80,000 and 100,000 fans to those games, and for the big schools when they play big games, having several hundred private jets flying in super rich alumni who will view the game from luxury boxes is the norm. 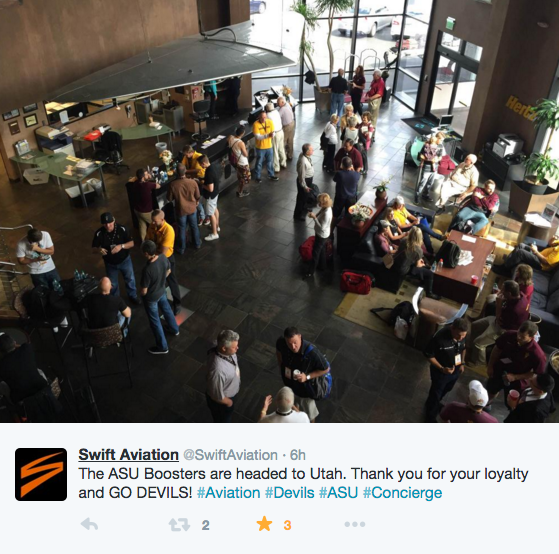 The picture above shows the lounge of Swift Aviation in Phoenix earlier today as fans of Arizona State mingled awaiting their private jets to see the Sun Devils play Utah tomorrow, not a marquis match-up. The Phoenix/Scottsdale area has three main airports that serve private jets and more than a half dozen FBOs (private jet terminals) like the one pictured above. This scene is repeated throughout the fall in dozens of cities around the country. Wealth-X research shows that UHNW consumers account for over $200 billion a year in luxury spending, and as a segment are the biggest “niche” of consumers buying watches, jewelry, fashion, luxury autos and fashion. While it may make sense for multiple reasons for luxury brands to bump heads with each other in places such as Art Basel Miami, the example of college football is a good lesson that the Super Rich have many other passion points beyond the arts. It is also good to remember as many billionaires dropped out of college as went to Ivy League institutions, and the vast majority matriculated from state universities. There are large Super Rich populations outside of New York, Miami and Los Angeles with plenty of money (there are more UHNWs in Minnesota than Russia and more super rich in Wisconsin than Saudi Arabia). For luxury brands seeking to grow high-value, high-spending consumers, a broader view of who the wealthy are, what their passions are and where they can be found is a good way to find new clients. At the same time, there will be plenty of appreciative posers and appreciative fans of the arts drinking free champagne in early December in Miami Beach. Bottoms Up! Luxury brands have invested hundreds of millions of dollars in CRM and building their database, and for the most part it is working. The one exception where traditional CRM capture is falling short is in the Chinese traveler market. The reason is simple. While brands typically have salespeople capture email addresses, many Chinese have eschewed email for WeChat, using the social platform as not only an all in one replacement for Facebook, Twitter, Instagram, Pintrest, etc. but for good old email. WeChat has grown in several years to over 700 million users! The desire of brands to capture data about customers, particularly emails, is critical as it gives the brand a way to stay in touch with customers even when a salesperson leaves. However, the new affinity for Chinese travelers to use WeChat in place of email has not escaped salespeople working at luxury brand boutiques. Needing an effective way to stay in touch with customers to schedule second fittings, notify them when a piece they wanted comes in, engraving is done or just to sell them more, salespeople working the Chinese market are communicating to customers from their private WeChat accounts. Building a WeChat database specifically of Chinese travelers to the U.S. is more important than ever with the new 10-year visas introduced at the beginning of this year. Applicants for the new 10-year renewal visas represent the frequent, affluent visitor to the U.S. luxury brands are courting, but are harder to find as they travel independently and not with tour groups. By building this database, brands will be able to market to this target during multiple annual return trips. WeChat is an opt-in multiplatform marketing dream that enables brands to communicate with customers, providing videos and webcams as well as enabling customers to share purchases with others on the platform. 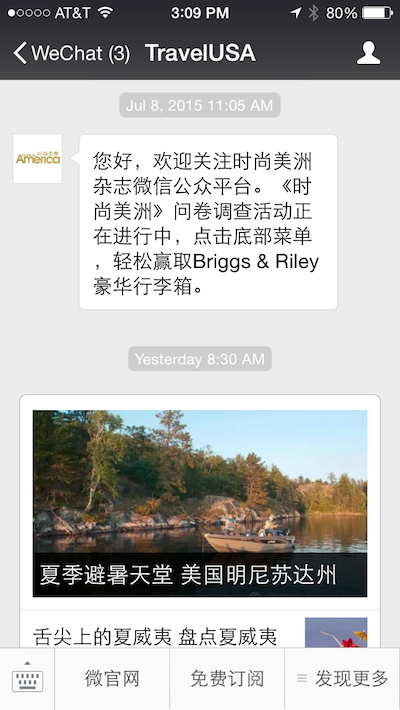 Alec Glos, CEO of i2i Media, a Shanghai based communications company specializes in assisting companies targeting Chinese travelers. Speaking about the growing importance of WeChat as a de facto email, he reported after a recent trade mission from America to China his team entered over 500 business cards of Chinese contacts. More than half the emails bounced or went unanswered. It turns out even though the emails were on the business cards, the Chinese executives had abandoned email in favor of WeChat’s replacement feature. Glos notes WeChat even has an appointment scheduling feature that enables users to schedule appointments. The ability to target repeat visitors from China is becoming more important. In 2014 nearly two-thirds of Chinese visitors to the U.S. were repeaters. This segment is not only the highest spending, but also is more likely to be traveling independently, so can’t be marketed to via tour group leaders. On the other hand, Chinese travelers stay in a variety of hotels, including non-luxury and with relatives, so local “concierge” solutions don’t work. i2i under Glos is now working with luxury brands that not only want to capture more of the $24 billion Chinese visitor market, but who want to strategically ensure they have ownership of their CRM. 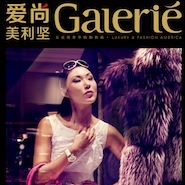 The upcoming launch of Galerie is an extension of the successful Essentially America platform, this time targeting Chinese visitors penchant for luxury shopping and real estate purchases. The platform begins by capturing opt-in Chinese visitors coming to the US who receive the magazines when they are getting their renewal visa. 80 percent come to the US within 60 days and 98 percent within six months meaning for luxury marketers who want to find a needle in a haystack of 1.3 billion people, the distribution method connects directly to the approximately 1.5 million repeat Chinese visitor market brands are seeking. i2i not only handles all of the implementation, including managing all the social media aspects of WeChat for the brands, but also takes care of translation. “It is like having dedicated support to the Chinese visitor market, which when considers has a $24 billion annual value just to the U.S. is something critical for brands,” Glos told me. Of course the key is being able to access Chinese visitors at the point of visa renewal.